Lefty and I recently had the opportunity to review The Swing Bat. The Swing Bat is designed to improve swing mechanics by giving an immediate three-phase feed back; hear it, see it and feel it. Lefty enjoyed using it and we had fun filming this review. Check out our review in this video and read below for more information. The Swing Bat is an excellent training tool that gets your swing on track fast. The Swing Bat provides an “auditory snap” sound at contact and an “enhanced visual” of the ball, as you “feel” the quick power being transferred at contact. You’ll get a precision swing every time! It’s simple to use and the results are immediate. You will be able to hit the “inside-out side” and the “curve” ball pitches into the gap and the holes with power. The Swing Bat will give you the edge needed in today’s competitive hitting game. The Swing Bat is considered to be the best and most reliable hitting aid on the market today. 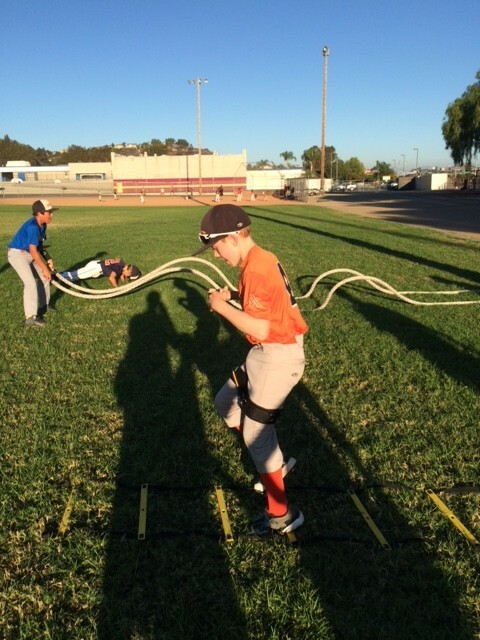 It is being used all around the country in: Little Leagues, High Schools, and Colleges with great results. High quality materials that are designed to with stand heavy daily use. This is not a cheap toy! The Swing Bat is engineered for optimal feel and balance. The Swing Bat is proportionately sized to fit youth and adult batters. You will not need a longer bat, the TSB 26” or 28” is all you need to get your quick swing on track! The unique patented TSB hitting trainer has an innovative way of teaching you to key into the dynamic components involved in swinging a baseball bat. TSB gives you consistent accurate and effective “feed back”. For developing better Eye-Hand coordination, Timing, Muscle Memory and Bat Hand control! TSB has three of the most valuable “feed back” elements: Audible, Visual and Feel! Signals built into It’s Patented design. The Batter is in the ready position, the ball is at the top of handle. As the TSB is swung the attached ball slides and makes contact, allowing the batter to “Hear” a distinct “snap sound”. The batter can “See” where contact is being made immediately in the swing. This combines a real ”Feel”of energy that’s being transferred at contact. All these biofeedback signals allow you to make corrections in your swing. From being: Early-Late to Right on the Money all with in a few swings. Check it out and tell them TheRustyArm sent you. You know those products you see and say, “that is a good idea, why didn’t I think of that’? When I first saw this product on TV a few years back, that is exactly what I said. Since then, I have not thought too much about bat weights until recently. At one of Lefty’s games, I saw his teammate struggle to get a donut on his bat in the on deck circle because he had a knob cuff on his bat handle. It seemed to make it difficult to slide the donut onto the handle of the bat. At that time, I was considering getting Lefty a standard donut and while doing research on weights and brands I remembered this product. I thought it was time to give it a try. 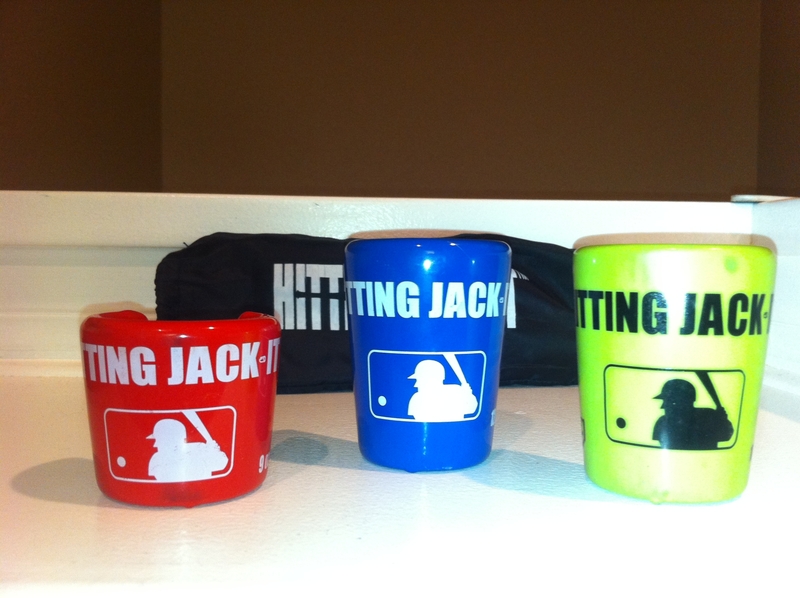 The Hitting Jack-It is the first and only weighted system on the market that can be used to hit “live” (with a pitcher) batting practice. The Hitting Jacket-It System includes three sizes to assist progressive training. There is also a 5 oz., 21 oz. and 30 oz. sold separately. The 9oz size develops bat speed and works fast twitch muscles. The 12oz size strengths hands and forearms, and improves muscle memory. The 16oz size develops power. The product works with all baseball and softball bats allowing players to develop during live batting practice sessions and off hitting tees. All current weighted products on the market are placed on the barrel of the bat causing a “casting” elongated swing, slowing down your swing causing less power and do not let you practice with live pitching. The Hitting Jack-it was developed as a complete hitting system by ball players for ball players to provide immediate results, quickly develop bat speed and power, and force your hands to work properly creating improved technique. After receiving the product, I took Lefty out with the 9oz. size and let him try it. He slipped the weight on the handle and slid it down with ease (upside down first, but quickly corrected). It was really cool to see in person how the weight stays down at the bottom the barrel and above the handle. I threw Lefty about 20 wiffle balls and he was able to swing and make contact. It never looked like it interrupted his swing or prevent him from making contact on the barrel as he normally would. I then told him to take off the weight. He did so by tapping the handle of the bat on the ground and the weight slid off. He did a couple of practice swings and said, “it feels so lite”. I threw about 20 more wiffle balls and he swung with ease. We both felt like his bat speed had increased. I could tell the bat felt lighter and more manageable to him even after that short amount of time. It was a lot of fun. 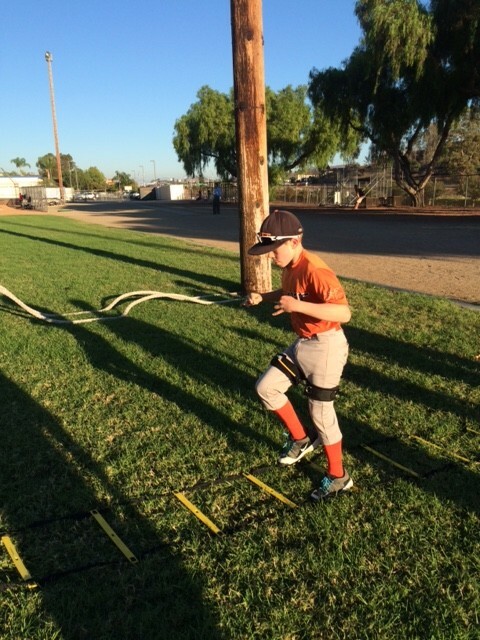 He enjoyed it and I was happy to have him work on his bat speed and strength. He threw it in his bat bag and said I am going to use this at practice. Can be done while in live batting practice, take as many swings as you desire, getting used to the added swing weight. Then remove the Hitting Jack-It to feel the added performance and increased bat speed. Slide the Hitting Jack-It onto the handle of the bat with the “wide end” facing up toward the barrel of the bat. Slide the Hitting Jack-It up the bat until snug. Turn the bat over and tap the bat on the ground firmly securing the Hitting Jack-It in place. For overall safety the open slot of the Hitting Jack-It should always face the catcher and the closed side with the logo should always face the pitcher. 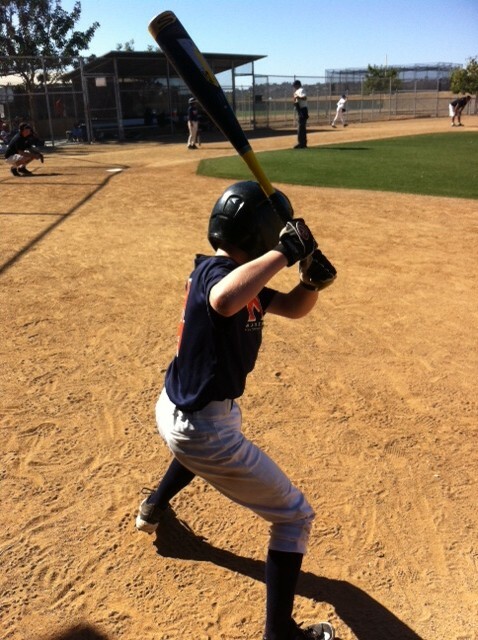 Removing the Hitting Jack-It is as easy as tapping the handle of the bat on the ground to free it from its firm grip. I really like this product. I like the fact that you can use it while hitting live pitching or batting cages and the system comes in three weights to grow with your player. The company was easy and friendly to deal with. If you are in the market for a batting donut, I recommend looking at The Hitting Jack-It. Lefty’s team started to use these Myosource Kinetic Bands to condition. I think it will be a great way to increase his speed an agility. Looking forward to seeing his progress. Resistance & Exercise Bands That Provide A Comfortable, Strength Building Workout For Your Legs, Hips, And Core! Kinetic Bands are a unique resistance band training product that provides a heart healthy, strength building workout for all ages (7+). These comfortable leg resistance bands fit just above your knees and are an affordable and effective way for anyone to strengthen their legs, hips, hip flexors, and core muscles while performing normal physical activities like walking, running, jumping, sprinting, and kicking. Strengthening these areas will help improve your balance, flexibility, agility, and endurance to run faster, jump higher, kick higher, react quicker and improve athletic performance. Kinetic Resistance Bands are ideal for use during sport-specific training because athletes can move unrestricted and in a natural manner with full range of motion. This allows athletes to get stronger while working to improve their skills and helps reduce the risk of sports related injuries. Kinetic Bands make a great gift for any athlete! Kinetic Bands also complement most workout routines and fitness/weight-loss programs and are great exercise bands for healthy minded people who want to get in shape, stay fit, lose weight, or burn fat. Get in shape while you ambulate. We guarantee results! Our leg resistance bands are used worldwide by: Physical Therapy Professionals; Strength and Conditioning Specialists; Speed Trainers; Individual Athletes; School, Recreation, and Professional Sports Programs; Personal Trainers; and people who want to live a healthier lifestyle. Hello Parents! When I purchase a product for Lefty (which tends to be often, according to Mrs. RustyArm) I will be sure to detail my experience which may help you in your search for gear. 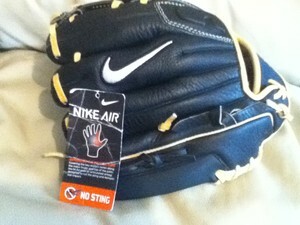 I recently purchased the Nike N1 Air Series BF1353 for Lefty. I wanted to get a little larger glove, better quality, more padding and a better structure than his current 11″ Mizuno. I first decided on the next size up to 11.25″. Lefty plays pitcher, 1st base and center field. I thought this size glove could work for those positions at his age. In addition to the size, I narrowed down my choices to gloves between $50 and $70. AND of course, the gloves had to be offered as Left Hand Throwing. I found three models I felt were good quality at similar prices. I showed all three to Lefty and let him choose. He decided on the Nike. Probably based on looks, but he has his reasons. I ordered through www.justballgloves.com and could not have had a better experience. Their pricing was competitive and website was easy to maneuver through. I purchased the glove for $69.99. No tax or shipping was charged. I received the glove by UPS 5 days after ordering. My initial inspection determined that the quality of the glove was as advertised. The purchasing experience was great. I will order again from the site. The glove is a good size for Lefty. It actually appears a little larger than 11.25″ than I expected. I was a little concerned that it may be too big for Lefty’s 8-year-old hands, but the fit is good and the glove is able to stay on his hand and he has control. The glove is just the right stiffness, not totally broken in but enough that Lefty could catch with it right away. I like the fact that he has to break it in by playing with it. This should make for a better fit in the long run. Lefty is currently using this glove during practices (using his “gamer” for the games) until the Nike is broken in and he feels completely confident with it. Should not be long. I am really happy with the quality of this glove and Lefty really likes the glove as well. 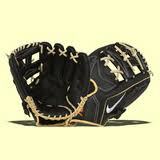 I would recommend checking out the Nike brand as you compare gloves for future purchases. I can’t wait until he needs a new bat! Beginning of the season, time for a new bat of course! I bought this bat for Lefty in July 2013. I waited to write this review to see how the bat held up and how much Lefty enjoyed it. With the Spring season starting, I had a few parents ask for a bat recommendation, and I highly recommended this bat. After seven months of regular use, the bat has held up pretty well. A few slight dents have developed but the bat still has pop and that great aluminum sound. I like the large sweet spot of the barrel and the balance of the bat seems perfect to me. Maybe it is the traditional one-piece style that I like, similar to what I remember bats feeling like. If you ask Lefty he not only gives it a Left thumb up, but a right thumb up as well. Since it is a 2013 model, a little hard to find now. But that is the way I roll. I like finding deals on previous year models. Lefty uses the 28″ -10 18 oz. model with the 2 5/8 barrel. I know some leagues don’t use big barrel bats, so check with your league. I found one recently online at Sports Chalet for $99.97! Gotta love that price! Just make sure the barrel is the size you are looking for. Happy Smashing! Looking for that traditional one-piece feel for your next bat? Look no further! The Easton Power Brigade S3 Senior league baseball bat is here to step up to the plate with you and smash those balls like you’ve never smashed them before. The S3 Senior league bat is a one-piece THT100 Aluminum bat that has great durability, a massive sweet spot, and black carbon handle. The bat is extremely balanced and has a very stiff feel. The S3 is part of the Power Brigade Speed Series which means that this bat is going to help those batters who need a little extra help in swinging the bat through the zone. The S3 comes in both a 2 5/8” barrel or a 2 3/4” barrel for those who are playing in the USSSA leagues that allow the bigger barrel.